I think that Tracey Emin is trying to tell a story of a certain person and how they have their bedrooms. You can tell that this person isn’t very tidy and they seem to spend a lot of their time in their bed. This can be very interesting for the viewer as there could be a few similarities that the person in the picture and the person viewing the image. I don’t really have any emotions when I look at this image as I don’t seem to have any emotional connection with the subject, however it does spark the question in my mind about who sleeps in this bed? What is their story? These are questions that aren’t really answered in the picture. I think that Emin has chosen to work this way because she likes to tell a story with her images, the title of this picture is ‘My Bed’ this would suggest that this is her bedroom that we are looking at but this isn’t confirmed or denied in the picture so if it is her room she is giving us this insight to how she lives, and it gives us an idea of how she was living at the time with medicines on the floor etc. I don’t know whether I would call this art as to me art has to have a purpose and this image does not have a purpose and it does not make me feel any emotional connection to the image. This image has no relevance to my practice at all but it is an interesting still life. 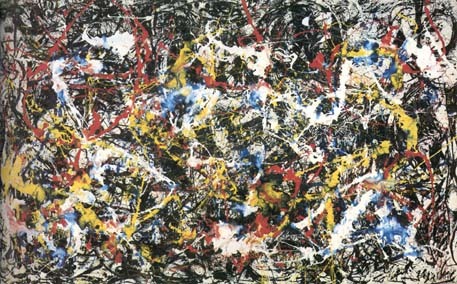 I think that Pollock’s intent with this image is to express his feelings with paint, Pollock may have been going through a tough period of time or just a tough day and he wanted to express what he was feeling. Or he could have started drawing a nice image but messed it up and scribbled it out in frustration? This is something that is not expressed in the picture so it is very hard to pin point the exact intent that the artist has decided to produce this picture. This image to me really doesn’t have an emotional connection and I don’t like how messy this image looks. The only questions I have with this image are why did the artist decided to do this and who really calls this art? To me this image just looks like whole load of pain splattered on a canvas for no apparent reason and in the most chaotic way possible. To me I do not call this work art because it has no purpose and I don’t have any emotional connection to the image except for confusement. To me art has to have a purpose and has an emotional connection to the viewer, this is something that seems to be lacking in the picture and I really struggle to see why the artist has decided to make the picture look like this and who would be interested in putting this picture on their wall and call it art? This image has no relevance to my practice at all. I think that the Chapman’s intent with this picture is to really shock people and make people stop and look at their work; if this is the case then I think that it really works because it really shocked me when I first saw them. The amount of detail in the picture and the subject are really shocking in a way because for me because I would not have added that much detail into the image because some of the images are horrific. It just isn’t my cup of tea really, the whole project makes me disgusted and I don’t know if it’s because of my religious background or that I wasn’t expecting this kind of detail and this type of theme. I think that the artist has decided to work in this way either to get a reaction from the viewer or to do a project on a subject that they feel interested. I do think that this work is art because the whole series has a purpose and it has a strong emotional connection to the viewers. This to me has the main boxes ticked for being considered as an art form but I really do not like this project at all and I would not want to have this piece of work on my wall, which for me is a big thing for art because art to me is something I can hang on the wall. This work has no relevance to my practice at all but it is an interesting still life. I think that Taylor’s intention with these projects is to show a serious of images showcasing levitation photography. This form of photography has always intrigued me but I haven’t known how to do this type of photography before, I love the shadows in the background with the chair disappearing in the shadow as this gives you more of a intrigue to the image as it almost looks like the chair is not real at all and it almost has a Peter Pan feel to the image where the shadow is not connected to the subject that you would think that it has a connection to. I think that this photographer has chosen to work in this way to express the relation of the chair and the model and to show case levitation photography. The image could also be a promotional campaign for the type of chair that is being used but I think that this is very unlikely. I am torn about whether this image is a work of art or not because it doesn’t really have a purpose but it does have an emotional connection to the viewer and I can see this image being placed on a wall, which are the main tick boxes for the image being considered as an art. This image has no relevance to my practice but it is a very interesting picture to look at and it is something that I have tried to do in the past with very limited success. I can’t really tell what Barney’s intention is with his work, but I really like the American football stadium picture, I love how you have a frame inside a frame, inside a frame. The first frame is the stadium seats which are framing the pitch and the pitch is framing the first goal posts and the goal posts are framing the second goal posts. The stadium lights are also flaring in the camera which acts as a leading line towards the end of the pitch. There is something of a quiet before the storm feel to this image as stadiums are well known for being loud and chaos in the stands and on the pitch, so to see the stadium this empty has this eerie feel to the image, almost like when you enter a school at night time, it has the same feel to it. I am not sure why the artist has decided to show this picture in this way as this is the only picture in the series like this, but the whole series have an eerie feel to it. I do think that this picture is considered as an art as a sports picture I can see this on the wall of the stadium as the purpose of the image could be an advertising campaign but I can’t be sure what the photographer was trying to achieve. This image has a relevance to my practice as I am interested in sports photography and this picture is of a sporting arena.